Who is Primarily Accountable for Long Term Planning – Board or CEO? Can you further clarify whom you see as accountable for making what decisions in relation to the various aspects of corporate strategy creation and execution? If the board approves the CEO’s decisions do they not become board decisions? Where is the scope for the CEO to be accountable for making his or her own decisions? The CEO is asked, in addition to heading operations, to be looking ahead in the organization’s mission focused field. This is very important where the board is largely an eclectic group of volunteers. The CEO should be thinking about these issues 24/7 and bringing what S/he considers the important ones to the board’s planning and resource committee, from which the board has a process for selecting those that have potential for further study by a board-staff ad hoc committee or task force. Where the board is composed of field professionals, like the Associated Press, the CEO still has an obligation to be on the frontiers of field changes and opportunities, obviously very important to the AP. * Board members from all backgrounds have an obligation to bring GENERATIVE, out-of-the-box, thinking to the board. Where this often falls short with nonprofit boards is that many attempt to acculturate directors to the culture of the organization, instead of being open to the person’s expertise and culture. For example, if a director has expertise in financial planning, nonprofits often will ask the director to be involved with immediate accounting issues, instead of expanding the organization’s financial outlook. 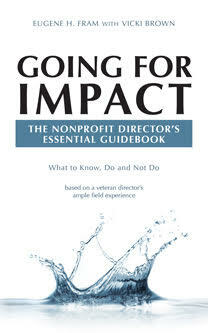 ← Dysfunctional Levels in Nonprofit Boards & Organizations. I disagree! The board, as representatives of the “owners” (constituents, stakeholders) is ultimately responsible for the success or failure of the organization, therefore, they are primarily responsible for the oversight of everything that occurs, including the formulation, executing, monitoring, evaluating, and control of any and all plans including strategic or long-range planning. In order for a nonprofit to be successful the Board, who hires the CEO, has to work together but their roles and responsibilities are not comingled. In the end, however a plan was formulated, ect. the Board, as representatives of the the Owners, make the final decisions and therefore, are primarily (ultimately) responsible (accountable) for whatever happens in that organization. As for the answer to this question, the Board provides leadership and the CEO provides leadership and management. Board Policies should exist that defines the roles and responsibilities of the CEO and her/his staff. This is called Board Governance. Thanks for enhancing the discussion. I would like to add to the discussion on this topic but first please allow me to introduce myself. I am an organizational scientist specializing in the management of nonprofit organizations. I am currently Chairman of the Board of Directors of NPdirection Pty Ltd.
As previous comments refers to both accountability and responsibility I thought I would check to see if these words have the same meaning. According to my copy of the Concise Oxford Dictionary they do. Each word refers to some individual or group of individuals being held accountable/responsible for something being done which, in this case, is long term or strategic planning. So we can think of the question as “Who will be held accountable for the organization’s long term plan?” and the answer must be the board. This view is also supported in the nonprofit literature. Studies have identified strategic planning as a key board performance factor with high performing boards found to have a strong strategic focus. Board direct participation in the strategic planning process has been found to be associated with a high level of board performance. As with many processes, strategic planning must be directed by the board even though people outside the board may be asked to do a lot of the legwork. For example, normally the strategic planning process would begin with an analysis of the current state of affairs in each of the key areas to be incorporated into the plan. The board provides guidelines as to what information is required and the format in which it is to be presented. Individuals outside the board provide this information for the board to review. It is then up to the board to decide whether the current direction is acceptable and likely to lead to improvement or whether it is unacceptable and a change in direction is required. On a proforma basis, I totally agree with you. But I think that in a fluid organization, like a small or medium sized nonprofit, policy/strategy issues can & should easily bubble up to management and the board.